Soccer has phenomenally grown in the world of sports and society in general. It started as being an exclusive sport mainly in European countries to a global one. So now, many are looking for ways to show their love for the game that is truly unique. With every country and organization having their own soccer team, there is the proliferation of soccer logos and brands in one’s reach. However, the big thing and crucial one in creating one’s logo is its uniqueness, making it stand out among the rest. And in here lies precisely the challenge to making a unique logo for a soccer team. Due to the almost omnipresent reality of soccer, characters found in different logos tend to look the same. But a reason for resignation to some can be a booster to you in creating your own singular soccer logo. Just as well as our logo designs, by looking at several of our soccer logos here, you can realize producing the unique and singular one for you. After this comes the more intricate part of your logo’s design: You can use strong, masculine colors in heavy shades and hues. Or you can blend sharp edges and and thick curves in the different shapes that are in it. Or you can add a little effect of a drawing that depicts a prior movement of, say, a ball or an athlete. To help you in a visualization of the above matters, in addition to the logos and templates found here, we also offer a multitude of generic sports logos. Our templates are available to download and easy to use. They come in PSD, Vector AI, EPS formats, which are easy to modify according to your needs. Some logos are free to downWith designs that are simple and elegant, these logos will give you a hint on how to develop one that is extraordinarily a standout. In this way, you can avoid looking like someone in the same marching line that always produces near-identical logos and designs. Being a soccer enthusiast, these logos will, no doubt, heighten your excitement and love for the game. In fact, the designs of our logos are meant for you to be able to express your passion in soccer. By the space provided for just below the word soccer or your team’s name, you can add a tagline and/or slogan for your team. This is not so hard to understand, as in many college logos you can have an idea of a slogan that isn’t pedantic or usual. There is a saying that tells what one sees in fascinating pictures are doubly enhanced in words. So with the imagery offered in our logos, you can be sure in not having a hard time finding the right words for your tagline. 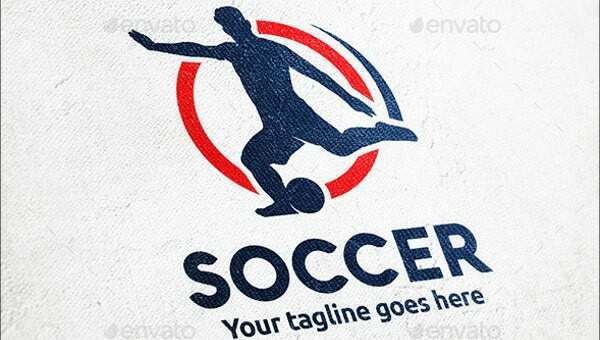 This being assured by your creativity, you can have the perfect soccer logo.